The hypothalamus is a small (about the size of an almond) region located directly above the brainstem. It is buried deep within the brain and not visible without dissecting the brain. What is the hypothalamus and what does it do? The hypothalamus is a collection of nuclei with a variety of functions. Many of the important roles of the hypothalamus involve what are known as the two H's: Homeostasis and Hormones. Homeostasis is the maintenance of equilibrium in a system like the human body. Optimal biological function is facilitated by keeping things like body temperature, blood pressure, and caloric intake/expenditure at a fairly constant level. The hypothalamus receives a steady stream of information about these types of factors. When it recognizes an unanticipated imbalance, it enacts a mechanism to rectify that disparity. Watch this 2-Minute Neuroscience video to learn more about the hypothalamus. 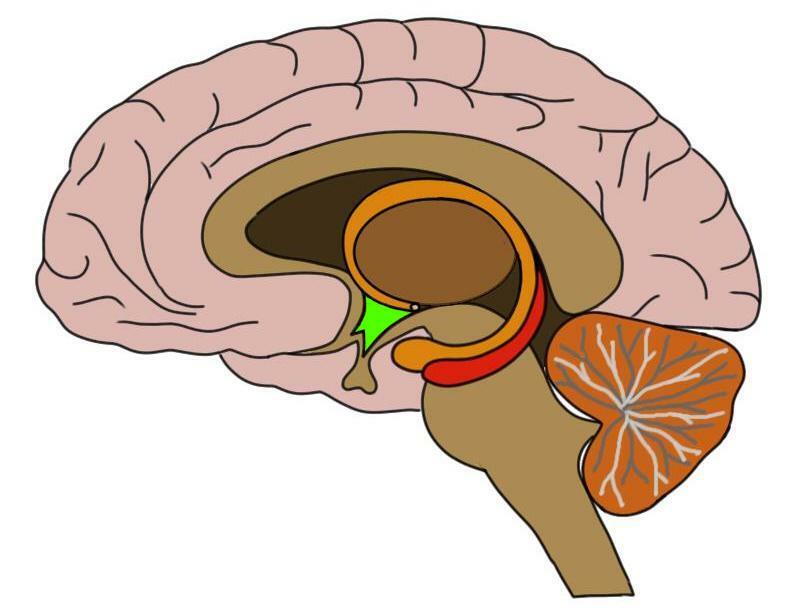 The hypothalamus generally restores homeostasis through two mechanisms. First, it has connections to the autonomic nervous system, through which it can send signals to influence things like heart rate, digestion, and perspiration. For example, if the hypothalamus senses that body temperature is too high, it may send a message to sweat glands to cause perspiration, which acts to cool the body down. The second way the hypothalamus can restore homeostasis, and another way the hypothalamus can influence behavior in general, is through the control of hormone release from the pituitary gland. The pituitary gland is a hormone-secreting gland that sits just below the hypothalamus. It consists of two lobes called the anterior and the posterior pituitary. The hypothalamus secretes substances into the bloodstream that are known as releasing hormones. They are so named because they travel to the anterior pituitary and cause it to release hormones that have been synthesized in the pituitary gland. Hormones released by the anterior pituitary due to signals from the hypothalamus (and their general role in parentheses) include growth hormone (growth), follicle-stimulating hormone (sexual development and reproduction), luteinizing hormone (testosterone production and reproduction), adrenocorticotropic hormone (stress/fear response), thyroid simulating hormone (metabolism), and prolactin (milk production). The hypothalamus also synthesizes a couple hormones of its own: oxytocin and vasopressin. These are then sent to the posterior pituitary for release into the bloodstream. Oxytocin can act as a hormone and a neurotransmitter. It has important roles in facilitating childbirth (hence the use of Pitocin to induce labor) and lactation, but also has been the subject of a lot of recent research due to its hypothesized role in compassion and social bonding. Vasopressin's main functions are to control urine output and regulate blood pressure (although it also seems to play a part in social and sexual behavior). The hypothalamus thus has widespread effects on the body and behavior, which stem from its role in maintaining homeostasis and its stimulation of hormone release. It is often said that the hypothalamus is responsible for the four Fs: fighting, fleeing, feeding, and fornication. Clearly, due to the frequency and significance of these behaviors, the hypothalamus is extremely important in everyday life.